The performance you expect from a fishing legend -- the result of quality craftsmanship plus up-to-the-minute features. Strong and unflinching under pressure. Lightweight graphite body and rotor; anodized aluminum spool with titanium spool lip; Sure-Click Bail™ with oversized titanium ball-bearing line roller; 6 stainless steel ball bearings (4520GX has 4); instant anti-reverse; ultra-smooth front drag with stainless steel and oiled felt washers; audible drag adjustment. FREE aluminum spare spool. "I got this reel for christmas, along with a tourney special spinning rod. Well i put this on an ugly stik that i previously had, and i put my Daiwa XiA spinning reel on the tourney special." "Great for all kinds of fish form bass to pike and from catfish and waleye even panfish i love this reel and going to get another a must buy"
"One of the best reel I've ever used, and for the price it can't be beat. I use it with an Ugly stick and braided line. 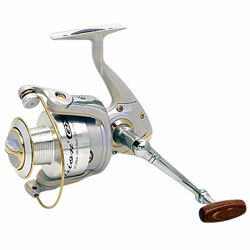 has caught ever thing from 9lb bass to large redfish"
I bought this reel for Christmas, and haven't fished with it yet. I spooled it up with line and I tested the drag and reeled it in, you know, pretty much gave it an evaluation. "